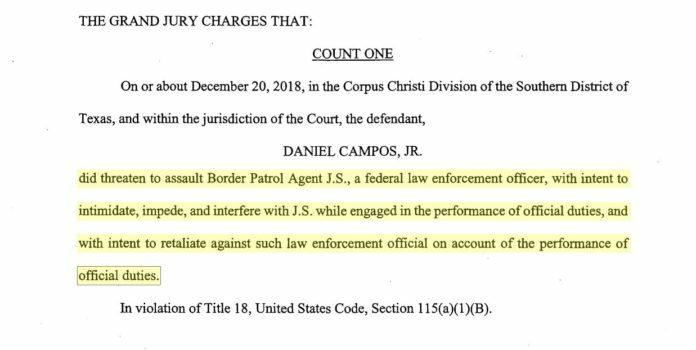 A local trailer driver could receive up to six years in federal prison for threatening several U.S. Border Patrol agents at the checkpoint in Falfurrias, court records show. Daniel Campos Jr., 49, of Weslaco pleaded guilty Thursday to one of five counts of threatening to assault a federal enforcement officer while engaged in performance of official duties, according to a news release from the Southern District of Texas U.S. Attorney’s office stated. Campos was indicted Jan. 23 on five accounts of the offense related to an incident in late December 2018, when he was driving a tractor trailer attempting to cross the Falfurrias checkpoint. During this encounter, Border Patrol agents tried questioning Campos at the checkpoint, but according to the Southern District of Texas U.S. Attorney’s office, he became hostile, argumentative and “refused to answer questions;” also, a Border Patrol K-9 was alerted to the vehicle during this exchange. 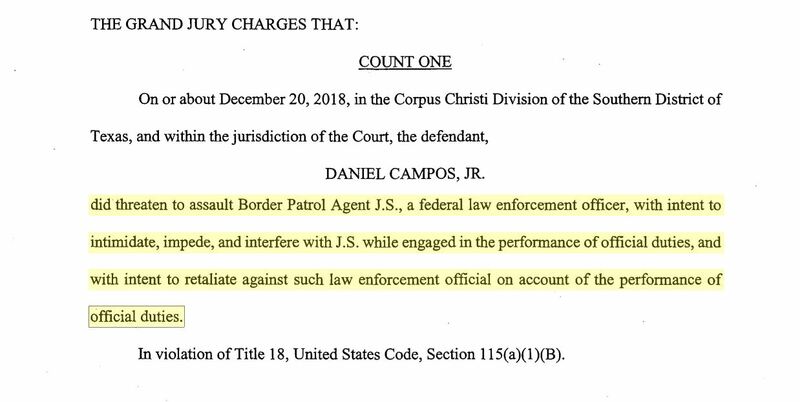 At the hearing, Campos admitted he threatened the agents, acknowledging he did so in order to intimidate, impede and interfere with the agents’ investigation. He also confirmed the threat occurred as a result of the agents performing their official duties as agents, the release states. In exchange for his guilty plea, government prosecutors agreed to dismiss the remaining four counts he was charged with, court records show. Campos, who has been in custody since his initial court appearance in early February, will remain in custody pending his sentencing hearing, currently scheduled for June 27, according to records. The FBI conducted the investigation, and assistant U.S. attorney Jeremy C. Fugate is prosecuting the case.